Here's the dessert for the celebration time as promised in my last post about my "First Blog Award". 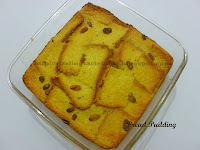 I prepared this yesterday and hubby was surprised by the sweet being served during weekdays. 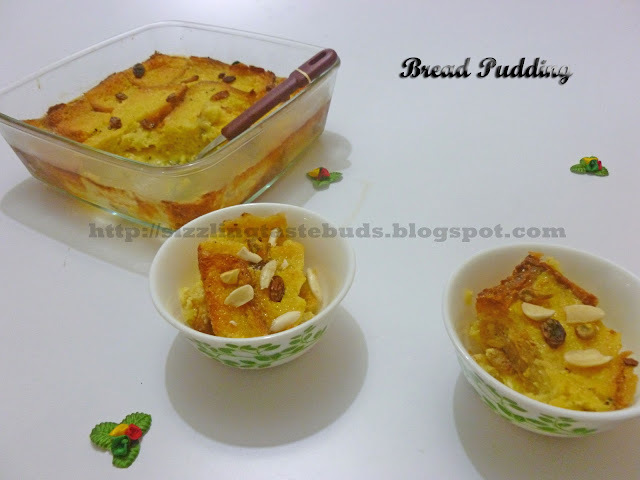 This Bread Pudding was so simple to prepare. Only time consumed is in baking. Wow! It was so yum and creamy. Loved it! I had some left over bread slices too, so I thought of preparing something from it and hence the dish was on my dining table in an hour. 1. Powder the sugar and cinnamom. Keep aside. 2. Take warm milk in a bowl and add butter to it. 3. Dissolve custard powder in some warm milk without forming any lumps and mix it with the warm milk in a wide bowl. 4. Beat eggs in another bowl. Add sugar, vanilla essence, cinnamon powder and sugar to it. Mix well. 5. Pour this egg mixture to the milk- custard bowl and mix well. 6. 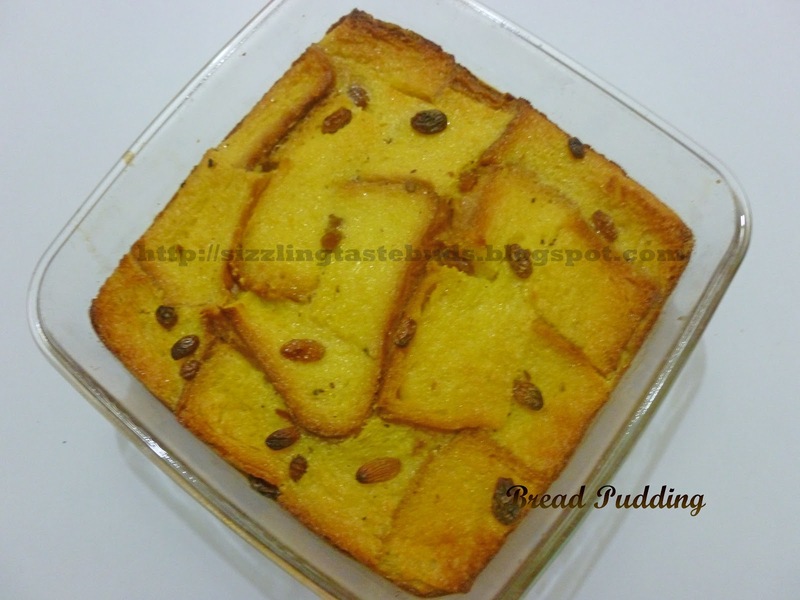 Cut bread slices into cubes and arrange it in a baking bowl as a bottom layer. 7. Pour some prepared milk - egg mixture on top of it as a second layer. 8. Spread some raisins over this and continue with another layer of bread pieces and milk- egg mixture. 9. Make sure the bread pieces are completely dipped in the milk-egg mixture. 10. 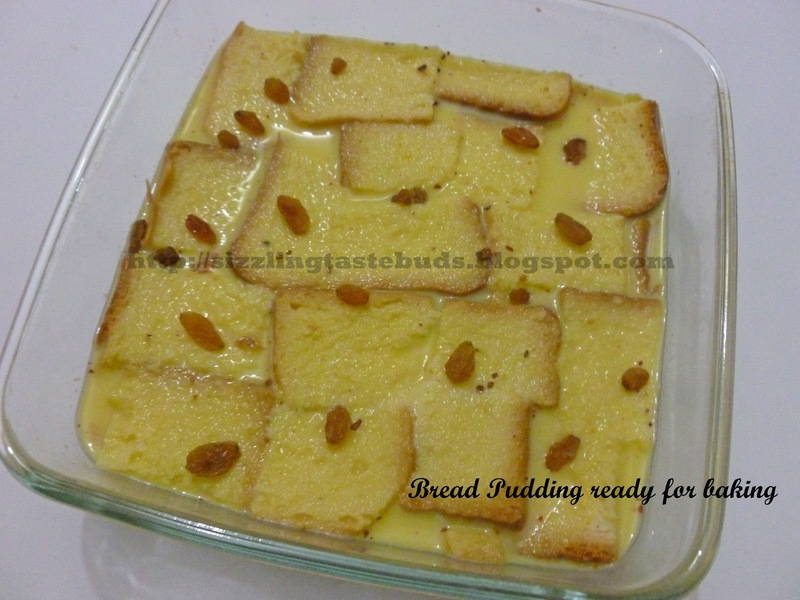 Bake this for 45 mins at 200 C for 50 mins. 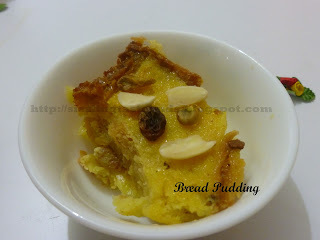 Bread Pudding is ready to be served. Serve it in bowls, garnishing it with nuts of your choice.